Matsue is often referred as City of Water and the pictures of sunset over the Lake Shinji often symbolizes the area. It certainly a beautiful city, but there’s much more behind the pretty pictures. Matsue is a modern city, but with remnants of Edo culture everywhere. The morning in Matsue started with the sound of birds in a drizzling gray sky. Such a contrast from the clear blue skies at the industrial port of Sakaiminato the previous day! We started out walking around the Karakoro Square to get on a boat. The first thing I noticed was the many Japanese sweet shops specializing in the intricate accompaniments for tea. After the lord Matsudaira Harusato (aka Fumai), who ruled the area in the 18th century brought tea culture back from Edo, the area flourished as one of the tea capital. That was the time when rather closed tea culture that was limited only to the lords and extremely well off merchants became more accessible to other classes. Even today, people live with the tradition and it is part of everyday life in Matsue. Inoue-san from Shimanekan once explained to me that Shimane hospitality is to always welcome guests with matcha and sweets. Any household keeps a pot of hot water and a tin of finely powdered green tea ready at all times. 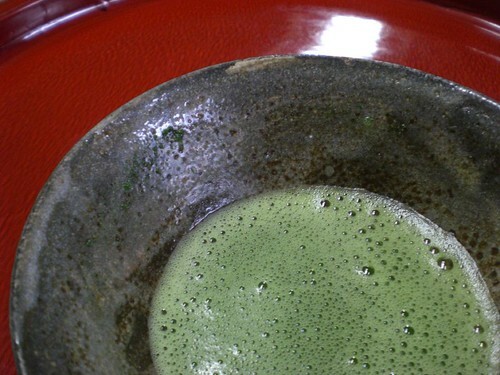 “Matcha is like instant coffee and it is quite simple.” And, a serving of foamy bitter tea always comes with a special treat. After grabbing red bean paste sweets for breakfast, we got on a small boat. 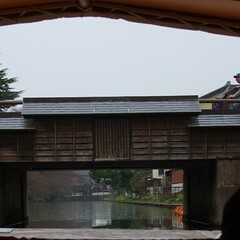 The skipper, or sendo-san, in his blue raincoat took us around the moat and canals around the city. 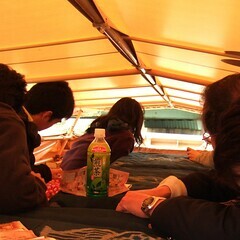 Being the end of March, the boat came with a little kotatsu, or low table with heater in the middle and blanket around the table. Tucking our feet under the comfortably warm table, we listened to the boatman singing old rowing songs and looked out at the the moss-covered walls or an elegant white heron resting in the middle of the still, green water. Time seemed to slow. Then, the skipper said “now we are coming up to a series of low bridges and make sure you duck”. I thought his message was just, lower your head, but soon I realized I was wrong when I had to push my face down on the kotatsu surface as the roof of the boat lowered to pass under the bridge. Even this inconvenience felt like a part of the charm of this city. Horikawa Boat Ride – Duck! The Horikawa Meguri Boat drops you off at several locations, so you can get on or off at a stop convenient for your plan. After about one hour, we got off to take a look at Bukeyashiki or Samurai’s Residence. It’s a small house where a middle-rank samurai and family lived and is now beautifully restored without looking tacky. I especially liked the authentic kitchen area. 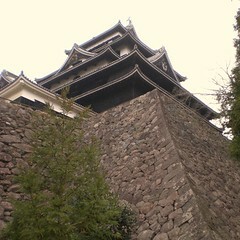 Next, we visited Matsue Castle known for the original tower from the 17th century. 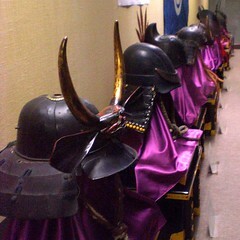 More than the beauty of the castle, though, we were impressed by their exhibition of suits armor. 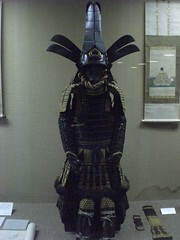 It may not be the huge, extravagant exhibition at Metropolitan Museum, but at Matsue Castle, they have quite an extensive permanent exhibition of armor, helmets, and other warrior items to give you a glimpse of samurai fashion. Everything in Matsue was just so magical. We did not have time to visit all the places we might have such as Lafcadio Hearn‘s former residence or another brewery I really wanted to visit, Toyo-no-Aki. We had planned to have a famous course meal of the seven delicacies of Lake Shinji the previous night, but we were totally fished out. We figured Matsue is one of those places we would definitely come back to, so we packed up after lunch and drove one hour to our next destination, Izumo Taisha Grand Shrine. International Visitor Discount– Matsue is very friendly to foreign visitors-Get 50% off at major museums. Please visit Tokyofoodcast’s San’in Trip: Day One, Day Two–Follow the Crab, Day Three-Fished Out and Monsters Too. For locations of the sites in the post, please visit Tokyofoodcast’s San’in Trip Series post.